Every week we’re asking our summer interns to share some thoughts and responses to various experiences and readings. 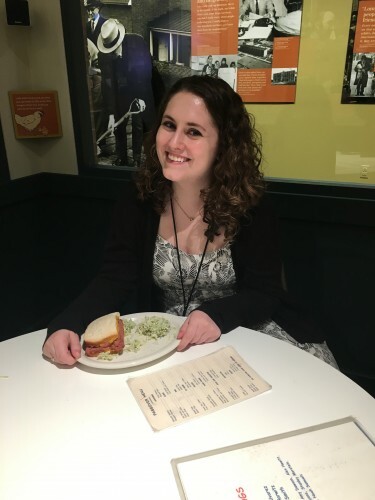 This week we asked them to select one of the Museum’s two core exhibits, Voices of Lombard Street and The Synagogue Speaks, and write an exhibit review. 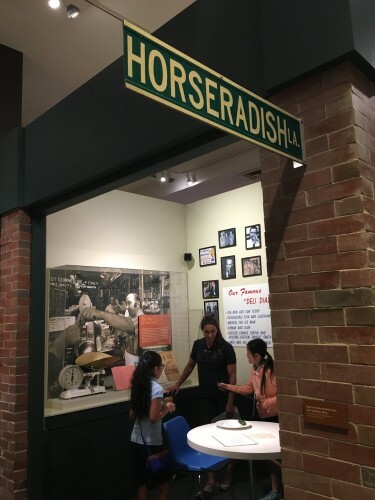 The Jewish Museum of Maryland’s Voices of Lombard Street: A Century of Change in East Baltimore offers an experience that will appeal to people of all ages – the opportunity to venture into a time and place that feel long vanished without the help of this exhibit. 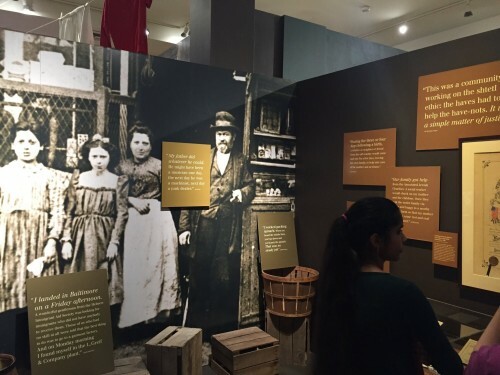 Immediately upon entering the Voices of Lombard Street exhibition room, the visitor is surrounded not just by echoes or recreations of the past, but also by the very words – both printed and voice recordings — of former residents of the neighborhoods the exhibit seeks to bring back to life through its detail- and daily life-oriented displays. 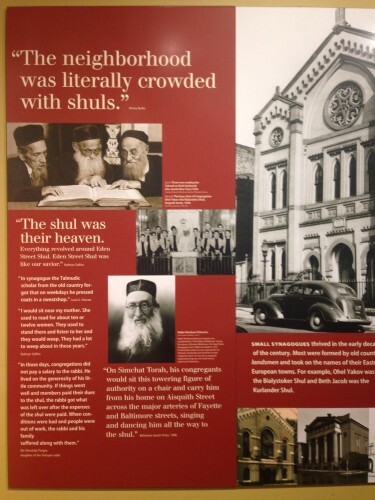 The exhibit begins with an introduction to the geography of the area, providing a useful map of the neighborhoods under study that charts the history of its population changes, and a brief description of the immigration process that led to Jewish Europeans to this section of Baltimore. An example of a life-sized image of a family, surrounded by quotes. With this basic information in mind, the visitor goes on to experience simple, yet evocative recreations of life on Baltimore’s East Side in the first half of the 20th century for the immigrants who became proud Americans who adapted their traditions to the demands of their new country and became mainstays of the neighborhood. 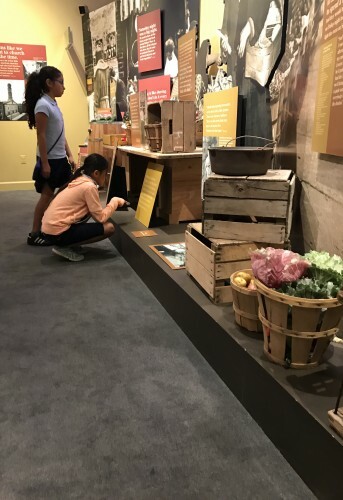 While plenty of text is available for reading, the exhibit is also replete with a mock kitchen and bathtub, outhouse, sweatshop, street-side where food products are sold, and deli, making it a perfect experience for the younger visitor who can pretend to make a dish with the plastic, but realistic-looking foods available, and an item of clothing with the old sewing machine. The life-size images of families that cover the space, along with the constant presence of actual quotes, makes for an experience that feels authentic and respectful of the neighborhood’s former inhabitants. The exhibit chooses to rely on what the neighborhood used to look and feel like, rather than let its current state cloud the visitor’s eyes. 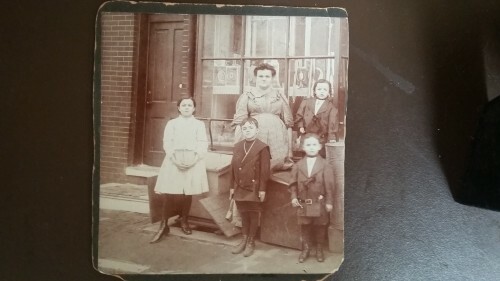 My own family in East Baltimore in the 1910s. 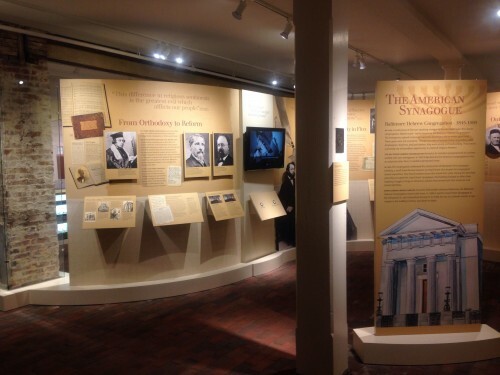 The vibrancy of the exhibit is added to by discussion of the relationships between different groups that made their homes in the neighborhood, as it distinguishes between German Jews, many of whom arrived to Baltimore in the previous century, and Eastern European Jews who arrived only towards the end of the century, and between non-Jewish European immigrants and Black American residents. Perhaps what Voices of Lombard Street achieves best is a depiction of a neighborhood that is equally cognizant of the good and bad of the lives it resuscitates, as well as the neighborhood’s tumultuous transformations. It acknowledges the poverty and unsanitary conditions that many immigrants experienced along with the hope for and possibility of better futures, as well as showing how immigrants and their descendants moved out of the neighborhood, the effect of the 1968 riots, and the housing projects of the 1990s. Though the neighborhood at its present state may appear completely different than the neighborhood on which the exhibit focuses, Voices of Lombard Street is a must-see in order to gain an enriched and holistic view of a place that is much more than meets the eye. The Jewish Museum of Maryland’s Voices of Lombard Street exhibit tells the stories of historic Jonestown. Through a series of vignettes, the rich history of Lombard Street comes to life by incorporating all the senses. Like the exhibit’s title suggests, voices and various sounds fill the gallery space to enhance the visitor’s experience. Chirping chickens bring the viewer to a market place. Various conversations play around the table at a replica of Atman’s Deli, emphasizing the restaurant’s deep roots in the city. Lastly, rumblings and thuds display the intensity and fear of the immigrant experience. In addition to the auditory elements, this exhibit elicits hands on learning and experiments. Viewers can touch countless items and props. For example, the gallery invites visitors to step on the sewing machine. The weight of the sewing machine really emphasizes the difficulty of a sweatshop. This exhibit creates a true mark of Baltimore’s past and present through not only using the voices but of recreating the experience and universe. The winding layout also pushes the viewer to travel back in time and escape. The narrow rooms and clear paths literally direct the visitor through a timeline and narrative of Baltimore. The physical space is very interesting and adds an additional dimension. This exhibit’s ability to evoke the senses and orientate the viewer truly provides an informative and purposeful space. The exhibit is immersive. When you are in the kitchen section you hear the sounds of a meal being eaten, but you also hear sounds from the street front and deli. Period photos have been blown up to life size and encourage a human to human interaction with the viewer. The exhibition also incorporates pieces from the museum’s object collection, both in a more traditional pedestal presentation and directly into the scenes that dominate each area. A pedestal layout of garment work related objects. The exhibition delivers Lombard Street’s voices as promised. You can hear them all around you and they fill the walls visually. The wall mounted quote collections allow for the museum to prominently share a much larger diversity of commentary then would be possible in a purely auditory experience. The exhibit is visually and content lush. The viewer gets the sense and presence of the mass of people that populated Lombard Street. A wall mounted quote collection. From the outside, the Lloyd Street Synagogue looks rather unimpressive. It simply looks like a large mausoleum-type structure with large pillars in front and an impressive wooden door. The only indication it was ever a synagogue is the sign located to the left of the entranceway that states the name. Walking in and experiencing the sanctuary and lower exhibition hall does the building justice. It may seem rather silly for one to visit a house of worship, after all, most people know what to expect inside: pews, a central stage such as an altar or bema, and artifacts and artwork that pertain to the said house of worship’s religion. What exactly makes certain houses of worship into museums? Taking a look at other important religious landmarks, we can see that places such as Notre Dame in Paris, or Sagrada Familia in Barcelona, both have historical significance that pertains to the history of the city/ region it is located. They both also have longevity. The Lloyd Street synagogue fits into these two categories. Coming into the Synagogue as a convert to Judaism, I knew a fair amount about what is inside and how it pertains to religious worship. If you are not a Jew, the tour guide, Ms. Alana Hayes, or another volunteer from the JMM, will answer any questions you may have. Walking into the sanctuary, the tour guide allows you to sit down in the pews, feeling as if you are a part of the congregation. The lecture given by the tour guide is informative but may be a little overbearing for some who are not history-savvy. Once preliminary information is given, I was invited up to the bema to see how an orthodox congregation worships. I was also invited up to the Arch to see the three Torahs, one with a Holocaust themed dressing around it. What really struck me though was when I went upstairs to the women’s seating. 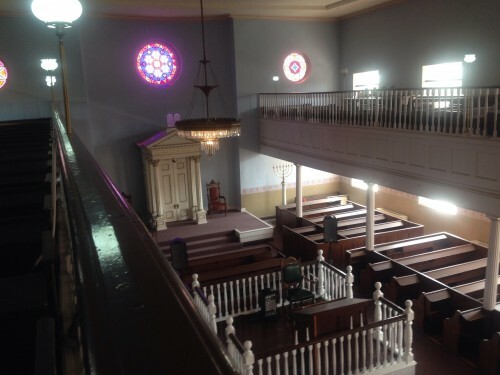 Hearing the old floor boards creak under my feet and sitting in the pews above the sanctuary really did give me the sense of sitting among history and imaging what it must have been like. It was a very moving experience. The tour guide then led us down to the lower floor to an exhibit hall where we were shown a preserved matzah oven, and a mikveh section. The downstairs exhibition area is the more traditional “brick and mortar” exhibition space with panels of information and photos. Interaction was also a big part of this section. A building-block model of the synagogue encouraged young children to play and reconstruct the building and a puzzle area was also present where kids could reconstruct the stained-glass Star of David that was a centerpiece in the sanctuary. What was most fun for me were the three TV monitors throughout the exhibit. I pressed the button to begin the short video clip where I learned of anecdotes about the synagogue’s three time periods as an orthodox synagogue, a catholic church, and then a synagogue again. The placards end at the present day where I was greeted with an explanation of how the synagogue came to be in the possession of the JMM. The mikvehs were the last part of the tour and I got excited to see them. They were the first Mikvehs I had ever seen in my life and I will be dunking into one in a few months as I finish my conversion. Overall this was a good experience. I came in knowing nothing about this building or why it was important and left with valuable information as well as feeling connected to the history. That is what a good exhibit is about. The Voices of Lombard Street exhibit provides a multi-cultural look at the community around Lombard Street in Baltimore. 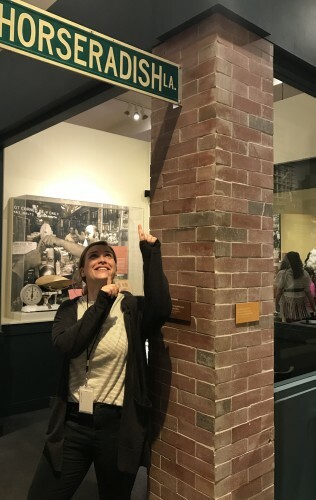 The exhibit takes you on a winding tour – literally – of various aspects of life in the community, giving the visitor information about its residents. One thing the exhibit did particularly well is that each space represents a physical area. For example, when earning about home life, the visitor stands in a make-shift kitchen. Information about working conditions is accompanied by an actual sewing machine. Or one can learn about restaurants while sitting in a makeshift delicatessen. An example of how the exhibit used artifacts to create a space. The exhibit is also very kid friendly, providing handy infographics to make history accessible to younger audiences. 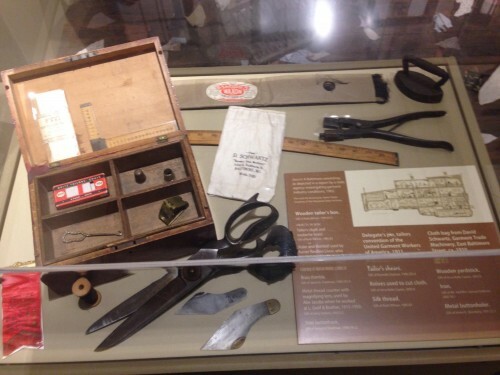 With movable props and a dressing trunk, the exhibit provides a sense of fun. The exhibit also relies on personal histories as well, putting up quotes about day-to-day life from the actual residents from the area; this makes the history of the neighborhood more relatable. Overall the exhibit does a really good job of making the voices of the neighborhood heard and by relating the exhibit space to the content. Often the most compelling narratives are ones which capture a community in all of its particulars. Voices of Lombard Street does exactly that, allowing the visitor a glimpse into the vibrant life of historic Jonestown across generations. True to its title, Voices of Lombard Street presents some of the many personal stories of the inhabitants of Lombard Street. The visitor moves through the recreated interior space of an East Baltimore home and out into the gallery space filled with sounds of the street and images of daily life. The images are accompanied by quotes from neighborhood residents. These personal stories add another layer to the immersive experience and ultimately are what bring the exhibit to life. After all what is a neighborhood without the people that populated it? The many voices of Lombard Street ring out loud and clear. After moving through scenes of Lombard Street, the visitor enters a recreation of Attman’s Deli, still on Lombard Street today. Here voices literally fill the space as the visitor listens to conversations of deli patrons. 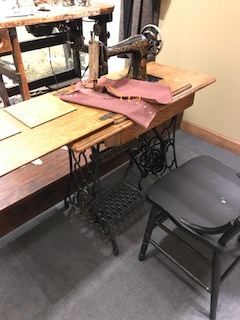 The diversity of stories and their delivery, including the didactic material and audio, support the many objects on display and interactive aspects of the exhibit — dining table, sewing station, deli sandwiches, and dress up. The stories and images throughout the exhibit bring the gallery spaces to life and engage the visitor in an personal way. You can read more post by and about JMM interns here!